For as much as history may fall under the ‘Humanities,’ occasionally the humanity of the past gets lost. Writing about the past can become clinical and historians can become immune to some of history’s horrors. Facts and figures of deaths in a war, for example, are faceless and can fail to elicit a strong emotional reaction. Personalize those numbers, however, and their weight is easier to appreciate. That is exactly what Marsha Forchuk Skrypuch does in Underground Soldier. The story follows Luka, an adolescent who has escaped from a Nazi slave labour camp during the Second World War. The conditions of Luka’s escape – by lying in a truck of dead bodies as it leaves the camp – serve as a precursor to the series of unpleasant, dangerous, and risky circumstances awaiting him. As he struggles to survive, he is subjected to the brutality of the war. With both the Nazis and Soviet Union representing threats to his life, Luka is faced with a dire situation as he examines his options outside the camp. It is here where the book flourishes, as Skrypuch’s poignant style allows the reader to absorb Luka’s feelings, eliciting empathy and compassion. In the podcast, Skrypuch says that this allows kids to understand what it’s like to be bullied, but there’s an equally important message to the historian. Stats are composed of individuals – individuals with unique stories and experiences. As a result, the book serves as a reminder of history’s humanity. In addition, Skrypuch takes the reader through a part of the Second World War that is generally forgotten in Canada. Luka’s story does not resemble the one told in most Canadian history textbooks. It’s not a tale of D-Day or Dieppe, but one of which Canadians should be more familiar. And while the book is classified as historical fiction, Skrypuch has gone to great lengths to ensure its historical accuracy – spending the better part of a decade conducting research. The character of Luka may be fictional, but his experience is all too real. Underground Soldier is a companion to Skrypuch’s two previous Second World War books, Making Bombs for Hitler and Stolen Child. The three work as a trilogy, but each can be read and followed on its own – a true testament to Skrypuch’s masterful ability to craft stories. While the intended audience may be children, Underground Soldier is a great read for adults. Its strength may be in capturing Luka’s emotions and taking readers along for the ride, but its value goes well beyond the storytelling. The book informs about a forgotten piece of the Second World War while serving as a reminder of history’s humanity. It’s easy to see why it has been highly anticipated by so many students across the country. 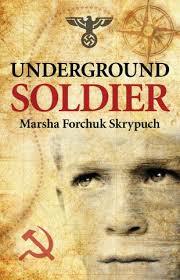 In this episode of the History Slam, I talk with Marsha Forchuk Skrypuch about Underground Soldier. We talk about the origins of her love for books, writing historical fiction, and her research methods. We also chat about shining light on forgotten elements of the past and literature’s ability to heal old wounds.